Patient #7 is a 48 year old female who presented to the Department of Neurology for evaluation and second opinion. She first developed symptoms two and one-half years ago when she began to feel unsteady when she was walking, especially when descending stairs. Her instability continued to progress and she would occasionally fall. She also lost interest in her hobbies, quit her job, and appeared to smile and talk less. Shortly thereafter, she began to experience vision problems; specifically she had difficulty focusing on objects close to her and had difficulty reading and watching TV. Her husband complained that she would not make direct eye contact with him and he described her as looking "scared" all the time. Past Medical History: Right upper extremity weakness secondary to a birth injury. 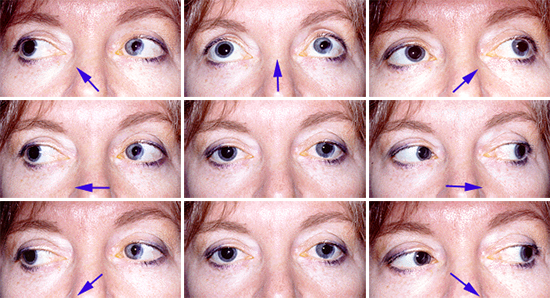 Past Surgical History: Left corneal transplant secondary to surgery, ruptured ovarian cyst, and hysterectomy. Family History: Negative for neurologic disease. Social History: No history of tobacco use, alcohol, or IV drugs. Review of Systems: Significant for dysphagia, liquids more than solids. She had urinary frequency with some incontinence, but no bowel incontinence. Vital signs were normal. Blood pressure: 104/60 sitting with a heart rate of 88, 100/58 standing with a heart rate of 92. General examination was unremarkable. Mental Status: Alert, awake, and oriented times three. Mini-mental status examination was 28/30 (two points deducted for serial 7's). Speech was slow, but fluent with repetition, comprehension, and naming intact. No difficulty with labial, lingual, or guttural sounds. Cranial Nerves: Pupils) Left pupil nonreactive, status post surgery. Eye Movements: Doll's head maneuver. Motor: Increased tone in all four extremities. Sensation: Intact to pinprick, temperature, vibration, and proprioception bilaterally. Cerebellar: Normal finger to nose, heel to shin. No loss of check or titubation. No tremor. Gait: Steady, slow, slightly stiff, with decreased arm swing. Normal toe walking, but difficulty with heel and tandem walking.